Let me take a moment to be “one of those moms”. 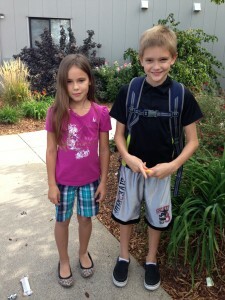 Pictured here is my eight year old son and his friend, Delany . Ryan did not do anything that special, really. He just spoke up for another kid on the playground. It hardly registered on his radar. However, unknowingly he saved her life. Another boy had pushed her down and was choking her windpipe. Delany could not breath, but could not tell the other children that she could not breath. Ryan saw it, knew that Delany was not OK, so he simply told the boy, “Stop it. You are hurting her. I said stop it!” Both the father and the mother texted Eric and I to tell us how brave our little boy was. Such a proud mama moment! Ryan saw someone who needed help and stepped up to make a difference. Now let me take a moment to be “one of those directors”. Pictured in this newsletter are pictures from our annual Community Retreat. My team did not do anything special really, they just did what needed to be done so that over 70 clients could go on a retreat and have an amazing weekend. I saw my staff step up and help someone who needed a little extra help over and over and over again at the retreat. 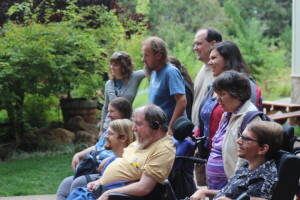 The retreat is such a wonderful time for me to observe my staff and clients. What I observed was an amazing team who didn’t do anything special but made people’s lives better every minute of our weekend together. I also observed awesome teamwork, as we problem-solved small and big issues as they came up over the weekend. We always see spectacular breakthough in our client’s lives when they step out of their comfort zone. Our staff stepped up and said, “Let me help. I want to make this a once in a lifetime trip. I want to make a difference.” I truly think I have the best team in all the world. Such a proud director moment! Thanks to each of you who went out of your way to be amazing on the retreat.